Inspiration of the "Royal Cape"
I made this royal cape for the queen of the Joyful Red Hatters. Our queen Joy is definitely deserving of being called queen. Many evening events involve going out into the cold weather, so I wanted it to be warm like a blanket, yet royal enough for our queen. Between the $50 for materials from my Red Hat sisters, a $50 JoAnn's Fabric gift certificate they gave me as a parting gift from my queen-ship with the group, and my 40% off coupon at JoAnn's Fabric, the cost was just about covered. I needed over 7 yards of fabric, and in the case of the Red Hatters there is a particular purple and red that the queen should wear. As much as I looked for fabric around the house there wasn't anything that fit the bill. So off to JoAnn's with my ideas. I looked over all the queenly purples and the warm cozy reds until I found the perfect colors. 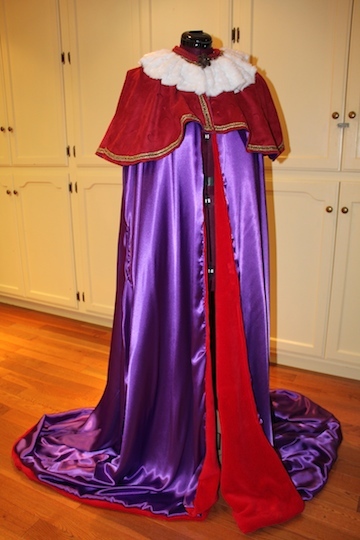 This cape was a fun project, but the caplet is my favorite part. A great opportunity to have some fun with fur and jewels. The caplet of the cape, is made separately, which is not what the pattern called for. Not only was it more practical, and easier to make separately, but it allows our queen options. If she's out on a warm evening, but needs to look somewhat royal, she can dress up an otherwise ordinary outfit with this little jewel. For a more practical version read on. The hard part was managing all that fabric on the rest of the cape. Make it out of wool or something appropriate for a coat. Check coats you already own for materials that could be put to use on this new cape. Maybe just enough for the caplet. 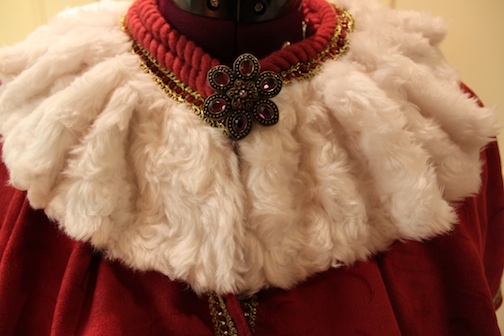 The rest of the cape could be done out of something else if necessary, and the caplet can dress it up. Add a collar of fur for extra warmth and pizazz, or consider the whole caplet in fur, or leather, pleather, and on and on. Then shorten the cape to the knee, waist or higher, and your there. Make a cape or cloak for warm weather, like maybe a sheer fabric to finish off a summer party dress, or a cotton, or knit to get the sun off the shoulders at the beach. Either way a light washable fabric would be ideal. So many possibilities, and so little time. Happy Sewing!